One of my favorite science books... no, wait... one of my favorite books altogether, is a shortish volume by Steven Pinker entitled Words and Rules. (I cannot remember how many copies of that book I have bought for various friends over the years, but I can pretty safely say that Pinker owes me a drink or two from his royalties.) I admired Pinker before I had read this book because I had already admired other books he had written. 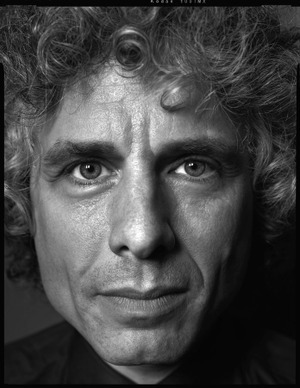 The first of these was the first book Pinker wrote for a wide audience: The Language Instinct. I read this book while I was still a very serious young student of analytical philosophy of language and mind in a Ph.D. program at Columbia University. Some of my philosophy professors didn't like the book, but I did. Here's why: Pinker knew a lot about the philosophical issues we were worrying about in our seminars, and he had empirically verifiable things to say about them. In fact, he had identified important and deep linguistic issues which had testable implications. And he always backed up what he said with a lot of footnotes (meaning he always cited studies to back up whatever it was he was asserting). This was very exciting and pleasing to my sciency heart. (My undergraduate degree is in Electrical Engineering and Computer Science.) What he was saying in The Language Instinct actually made predictions and retrodictions (explaining what we already know to be true from past observation is just as important in science as any soothsaying of the future) about very concrete patterns in how language is actually acquired by children, and used by adults. In any case, the reason Words and Rules is such a favorite of mine is that in it, Pinker manages to squeeze a shocking amount of intellectual juice out of something seemingly quite dry: the nature of regular and irregular verbs (walk--walked/go--went) and regular and irregular noun plurals (kid--kids/child--children). It is truly a tour de force: one of those rare small books (like Language, Truth, and Logic by A.J. Ayer, Fact, Fiction, and Forecast by Nelson Goodman, or The Idea of a Critical Theory by Raymond Geuss) that changes how we think about something very important. But I really don't have space here to tell you why that book is so wonderful. On the other hand, before we get to The Stuff of Thought, we can and should try to answer this: why is language and how we actually use it so important? It's because of nothing less than this: we want to know what the meaning of life is. Things become especially interesting when we come to the predicate "true." What does that apply to? Clearly not to words, as it seems obviously stupid to ask if "cat" is true or not. Clearly it also does not apply to very long collections of words, as it seems equally nonsensical to ask whether "Hamlet" is true. So, what does "true" apply to, properly? Basically: propositions, or more loosely, sentences. Something like "Snow is white" can actually be true or false. It happens, in this case, to be true. And it is truth which connects philosophy through language to science, because science is concerned with representations of the world which are true. Not beautiful, not good, true. So a map can be "true" to the degree that it correctly represents a given terrain. Similarly, "Snow is white" is a bona fide scientific statement. It is a representation in language of a state of affairs in the world. But we represent reality in our minds in other ways besides language and those representations are not all available to our conscious selves by simple introspection. What Steven Pinker is out to do in The Stuff of Thought is to tease out what our patterns of language use can tell us about how we think and the very nature of our minds. This linguistic approach to cognitive science turns out to be very fertile indeed, and combines and connects the subjects of Pinker's previous books on language, which I have already mentioned, with some of the ideas expressed in his How the Mind Works. In fact, if it weren't so unwieldy, the title What the Language Instinct and Words and Rules Tell Us About How the Mind Works could have been pressed into service. Jared sprayed water on the roses. Jared sprayed the roses with water. Betsy splashed paint on the wall. Betsy splashed the wall with paint. Jeremy rubbed oil into the wood. Jeremy rubbed the wood with oil. Pinker now considers and rejects three possibilities: First, maybe we have over-generalized the rule. Maybe verbs have some trait that children can sense that indicates that they resist this alternation. But if such a trait exists, it is not very obvious what it could be since load, pour, and fill are all ways of moving something to another place, but pour only allows the content-locative (pour water), fill only allows the container locative (fill the glass), and load allows both (load the hay, load the wagon). Second, it might be that children simply memorize which constructions are allowed for which verbs, one at a time. This is unlikely because children have to master an infinite language and only have a very limited set of samples to learn from. Also consider that when new words (or new senses of words) enter the language, such as burning songs onto a CD, no one has trouble generalizing to the container-locative burning a CD with songs. Indeed children do generalize to the container locative even when they could not have heard the usage from their parents. Many examples can be found in children's speech which has been recorded by psychologists, such as "I hitted this into my neck." Imagine that the meaning of the content-locative construction is "A causes B to go to C," but the meaning of the container-locative construction is "A causes C to change state (by means of causing B to go to C)." In other words, loading hay onto the wagon is something you do to hay (namely, cause it to go to the wagon), whereas loading the wagon with hay is something you do to the wagon (namely, cause it to become loaded with hay). 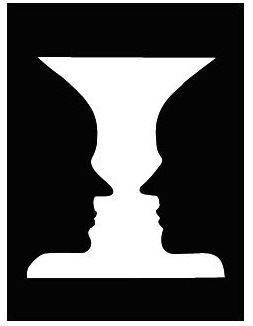 These are two different construals of the same event, a bit like the gestalt shift in the classic face-vase illusion in which the figure and ground switch places in one's consciousness. A rule of semantic reconstrual (the gestalt shift): If a verb means "A causes B to move to C," it can also mean "A causes C to change state by moving B to it." When one loads hay onto a wagon, it can be any amount, even a couple of pitchforkfuls. But when one loads the wagon with hay, the implication is that the wagon is full. This subtle difference, which linguists call the holism effect, can be seen with the other locative verbs: to spray the roses with water implies that they all got sprayed (as opposed to merely spraying water onto the roses), and to stuff the turkey with breadcrumbs implies that it is completely stuffed. The holism effect is not an arbitrary stipulation tacked onto the rule, like a pork-barrel amendment on a spending bill. It falls out of the nature of what the rule does, namely, construe the container as the thing that is affected. And that, in turn, reveals an interesting feature of the way the mind conceives what things are and how they change. The holism effect turns out not to be restricted to the locative construction; it applies to direct objects in general. For instance, the sentence Moondog drank from the glass of beer (where the glass is an oblique object of from) is consistent with his taking a few sips. But the sentence Moondog drank the glass of beer (where the glass is a direct object) implies that he chugged down the whole thing. Bees are swarming in the garden. The garden is swarming with bees. Verbs that differ in their syntactic fussiness, like pour, fill, and load, all pertain to moving something somewhere, giving us the casual impression that they are birds of a feather. But on closer examination each of these verbs turns out to have a distinct kind of semantic fussiness--they differ in which aspect of the motion they care about. Other verbs which, like pour, do not allow the locative alternation (you can't dump a truck with iron) are: dribble, drip, drop, dump, funnel, ladle, shake, siphon, slop, slosh, spill, and spoon. On the other hand, here are some seemingly similar verbs that do allow the alternation (you can smear grease on the axle, or you can smear the axle with grease): brush, dab, daub, plaster, rub, slather, smear, smudge, spread, streak, and swab. To see why they are different, we can once again look at the physics underlying their meanings: in the first set of pour-like verbs, we let gravity do the work, while in the second set, the agent applies force to the substance and pushes it actively onto it. And the mind makes these fine distinctions when deciding whether the alternation should apply or not. Even the most palpable cognitive distinction--who did something, and who had something done to him--can be mentally flip-flopped, as when a hockey player shouts, "Kiss my elbow!" or when Woody Allen in Play it Again, Sam gets roughed up by some bikers and tells his friends, "I snapped my chin down on some guy's fist and hit another on the knee with my nose." I hope I have managed to give some sense of the content and tone of the book. The rest of it is just as jam-packed with facts and ideas about how and what the structure of language can tell us about how our minds work, as the small part I have presented. Pinker also discusses ideas that he thinks are wrong. One of my favorites was his destruction of Jerry Fodor's Mentalese, but he is equally effective in dismissing other interesting but ultimately fruitless ideas. It seems conventional when reviewing a book favorably to trot out a few petty criticisms to give the appearance of objectivity and balance. I shall commit no such crime and recommend the book as highly as I can recommend any book, without reservation. It ships on September 11th, but you can order it now. Buy it. And read it. You'll find yourself educated and entertained at the same time. Full disclosure: when the publisher sent me a review copy of the book, I was pleased to find my own name cozily nestled in the list of those thanked in the acknowledgments section, to which after reading the book I can only say: no, Steve, thank you. All my previous Monday Musings can be seen here.